Oh no they didn't, oh yes they did go there, and this ad creative had Daily Billboard at 'She's got a new vagenda'. 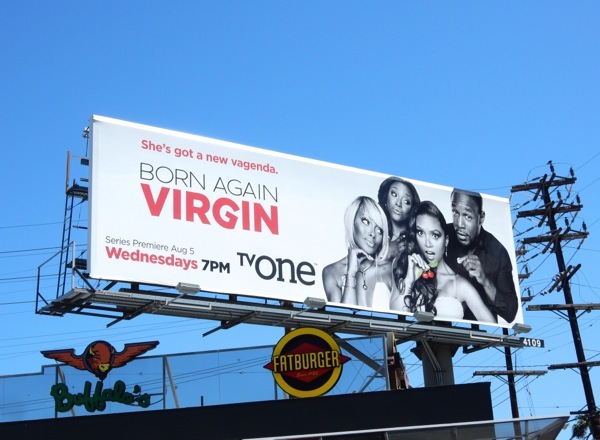 In addition this Born Again Virgin billboard has its titular reborn virgin holding a cherry, so talk about laying it on thick so you'll get the message. In this comedy set in Atlanta, Danielle Nicolet stars as a 30-something blogger, 'Jenna', who decides to become celibate after a string of unsuccessful dates and relationships. Meagan Holder and Eva Marcille are her best friends and R&B singer Durell "Tank" Babbs plays her neighbour and potential love interest. 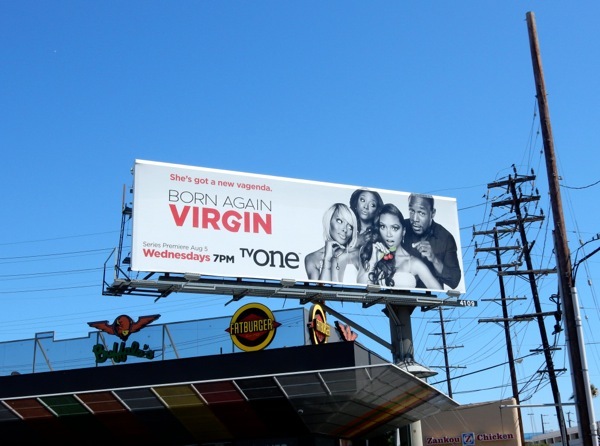 This fun series premiere billboard was snapped along Santa Monica Boulevard at Sepulveda Boulevard on August 8, 2015. Hmm, Daily Billboard wonders how long Jenna will be able to stick to her 'vagenda', otherwise the next season may have to be called Born Again 'Again' Virgin.